18 | June | 2011 | SHANNARO!!! Hi guys, another week another chapter. 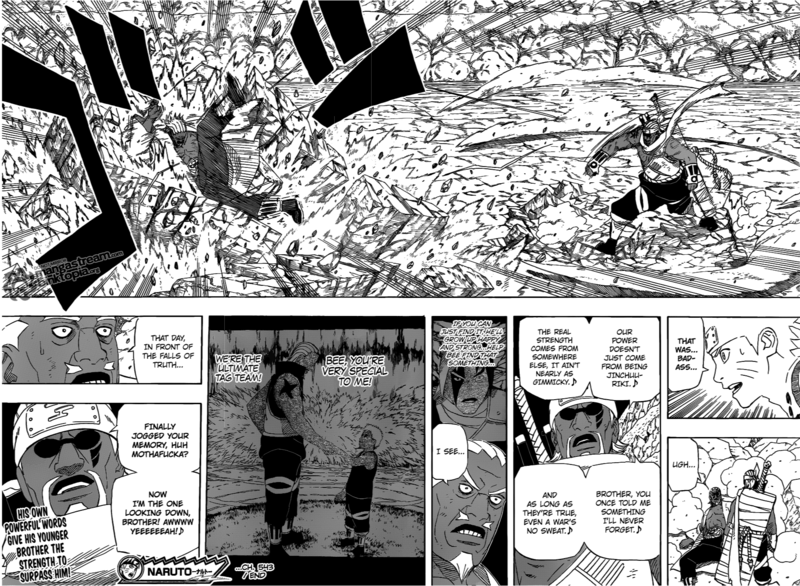 This week we see the resolution of the hurdle put in front of Naruto and KB by Raikage and Tsunade’s arrival, albeit a little too predictable but nevertheless a nice way of resolving things without bloodshed. I wouldn’t have minded seeing Naruto and KB tag team the Raikage for a couple of more rounds though. Seeing the way those two just being owned by the Raikage like that shows that they have a lot more team building to do before seriously considering taking on the heavy hitters of Akatsuki in the battlefield. It was also a pleasant surprise to see Kishi extending the flashback encounter between Minato and young Raikage and KB this chapter. 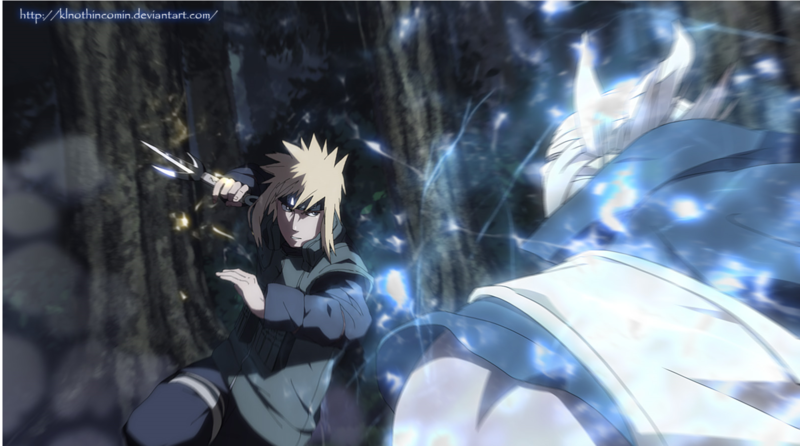 Although it was for the most part a one-sided battle for Minato, KB did manage to land a stalemate by reacting in time to where Minato would be teleporting to and placing his sword in the correct place for his own counter. So I guess this is where KB added the “killer” moniker to his name then? I wonder if Minato would have followed through on killing KB though – because killing a Jinchuuriki would release the tailed beast within and cause a whole load of trouble for everyone. Also, why the Minato’s entire team retreat without their leader? I know there was a signal from command, but their enemy was right in front of them. 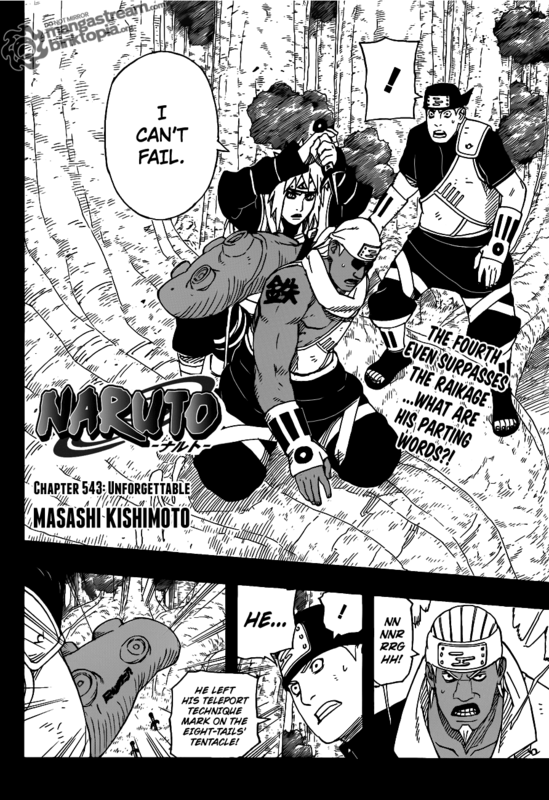 Yet the bunch of cowards ran even before Minato turned his back on the enemy, hmmm…. Although I had serious doubts Raikage would follow through on his threat to kill Naruto instead of risking him getting captured by Akatsuki on the battlefield, I did expect him to give the young pup a serious thrashing to put him in his place. 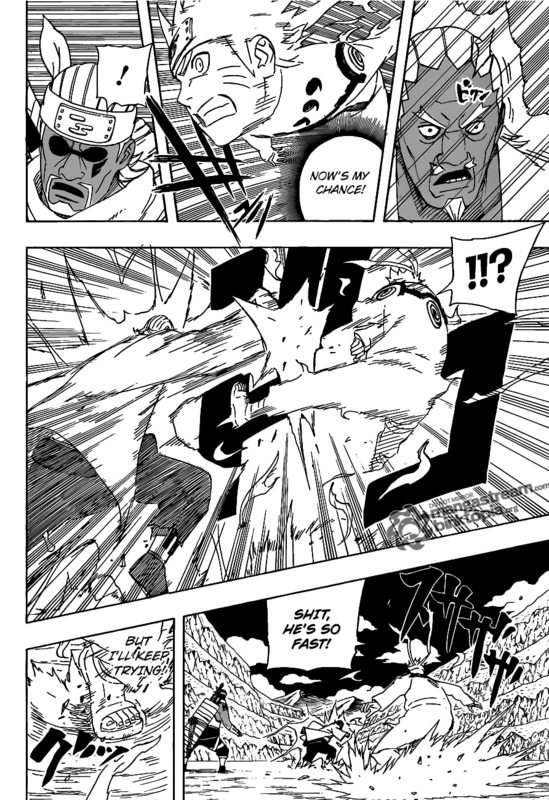 In recent chapters, I felt that Naruto was getting a bit too cocky over his new powers. Even though his intentions are good, for him to brashly head to the front without heeding anyone’s advice is actually a little selfish since it might just screw up everything the alliance has been fighting and sacrificing lives for. So I guess I was a little disappointed when KB pretty much won the argument against his brother by winning the lariat face-off. Once again Tsunade did absolutely nothing to help, okay she did step up and take Naruto’s side near the end, but we all know the only way to get it through to a meathead like the Raikage is to beat him through physical violence. In the end, the Raikage wasn’t such a single-minded warhawk like I thought he was, well, at least not completely. He took on a lot of responsibilities when he became the Raikage at the end of the last Ninja War. And being the Raikage meant he had to keep the safety of the entire village in mind, even if that meant pushing his own brother away and essentially isolating him for the benefit of the people. Still, I think in the back of his mind, the Raikage is waging this war in order to protect his little bro; he might have been ready to kill Naruto if it meant to stop Madara’s plans, but I doubt he’d do the same to KB. Well anyways, a happy conclusion to this little problem. Next week we’ll likely see Sakura shine as she comes up with a solution to the Zetsu clone problem in the camps and hopefully after that we’ll finally move on to Day 2 of this war.